Ram 1500 - Safety Tech Galore | Elgin Chrysler Ltd. 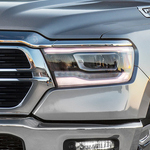 The all-new Ram 1500 has been updated for the 2019 model year. With this update, Ram has fitted the Ram 1500 with a lot of safety technology. This technology helps the Ram to stand out in the popular light-weight pick-up truck segment. Our team in St. Thomas really are excited about all of the new safety features on the Ram 1500. One such feature is the standard six airbags. These airbags use an advanced technology called adaptive venting to keep all of the occupants safe in the event of an accident. Another feature is Guided Parking. This system can actively help you park in both parallel and perpendicular situations. This means the system will engage different gears, the accelerator, and the brakes to help you park as safely as possible. The all-new 2019 Ram 1500 has been adorned with many safety tech features. If you want to experience these features take the Ram 1500 for a test drive at Elgin Chrysler Ltd.